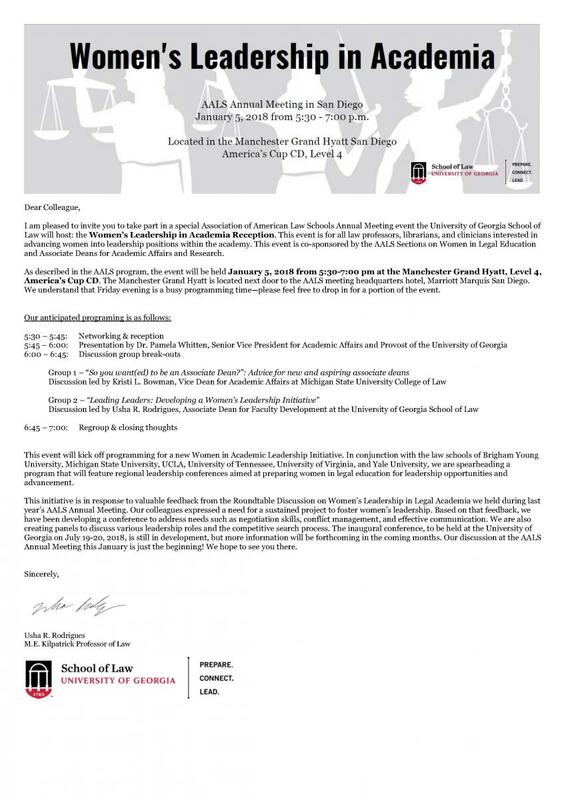 Law professors, librarians, and clinicians “interested in advancing women into leadership positions within the academy” are invited to take part in a special University of Georgia School of Law reception at next week’s annual meeting of the Association of American Law Schools. As described in the AALS program, the event will be held January 5, 2018 from 5:30-7:00 pm at the Manchester Grand Hyatt, Level 4, America’s Cup CD, San Diego, California. University of Georgia Provost Pamela Whitten (left) will give a presentation at the reception, which will also feature breakout discussions led by Kristi L. Bowman (right), Vice Dean for Academic Affairs at Michigan State University College of Law, and Usha R. Rodrigues (below right), Associate Dean for Faculty Development at the University of Georgia School of Law. o-sponsoring are the AALS Section on Women in Legal Education and the AALS Section Associate Deans for Academic Affairs and Research. “This event will kick off programming for a new Women in Academic Leadership Initiative. In conjunction with the law schools of Brigham Young University, Michigan State University, UCLA, University of Tennessee, University of Virginia, and Yale University, we are spearheading a program that will feature regional leadership conferences aimed at preparing women in legal education for leadership opportunities and advancement.